I have a 48MHz Crystal Oscillator (see here) that I am using as a clock for my microcontroller (EFM32GG332F1024). 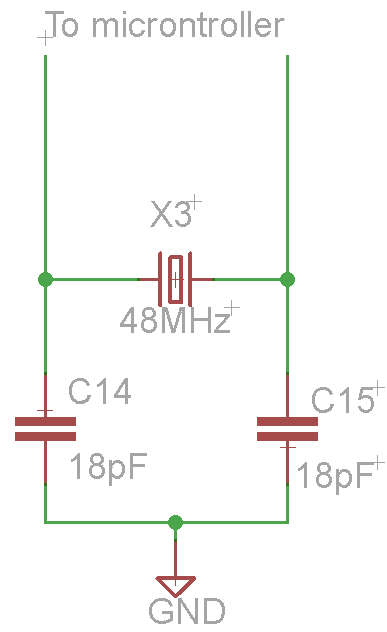 Looking at the datasheet for this crystal it seemed to me that the load capacitance is to be 18pF, I have taken this to meaning that I should have an 18pF capacitor from each pin to ground, however, I am not entirely sure if that is the correct thinking. Doing some reading around I have found a calculation to work out the load capacitance for each pin but this gives me a value of 30-36pF once I have entered all the known values and to me this seems too high of a value to use. The problem that I am having is that instead of the oscialltor outputting a frequency of 48MHz as expected, it is only outputting 16MHz, precisely a third of what it should be, and I am not entirely sure why this is. I have tried changing the crystal, changing the load capacitance, both up and down, and nothing appears to have an effect on the output frequency. I am not entirely sure of what is causing this issue or how to fix it as the capacitors appear to be doing nothing which is unexpected, so if anyone has any ideas about this problem, please feel free to give advice/ solutions. Something useful to know might be that I am measuring the frequency with a x100 probe on a digital oscilloscope by measuring from one of the crystal pins to ground. Neither of the pins give the expected reading so I feel at the moment it is irrelevant which one is which. I think I am right in saying that the crystal has no polarity as it is just a two pin device that can be seen from the link at the beginning of this post. First, you have a crystal not an oscillator. Majenko's comments on the load capacitor are correct, you should have roughly 30pF on each side, but that's not your biggest problem (load capacitor problems can only pull the crystal frequency slightly). The crystal is a 3rd overtone type so it will oscillate at 1/3 the marked frequency unless you add some tuned circuit to encourage it to oscillate at 48MHz. As you can see from the datasheet the fundamental crystals in this series only go to 30MHz. You really shouldn't be using such a high frequency crystal anyway if there is any other way- using a PLL internal to the micro to step up a lower frequency crystal is a common ploy. Crystals are best between about 4MHz and 20MHz, higher or lower and there are drawbacks. If you really insist on 48MHz for some reason, maybe you should actually buy an oscillator which will have the required crystal, tuned circuit, and amplifier circuitry inside one package, guaranteed to work. Not the answer you're looking for? Browse other questions tagged oscillator crystal capacitance or ask your own question. What effect does selecting the wrong load capacitance for a crystal have?